The City of Paducah provides yard waste, brush, and limb collection to residents as a part of their monthly service charge for solid waste collection. The City has changed to a call-in request system with brush collection based upon a minimum volume of material to be collected. Also, residents are asked to manage some of their yard waste/grass clipping at the household level by mulching or by using the garbage rollout for smaller volumes of twigs and bags of yard waste. Leaves and grass clippings should be bagged, not to exceed 50 pounds per bag. All yard waste shall be placed at your point of refuse pick up. Large tree limbs, stumps, and trunks are special collections, and there could be a minimal charge. To request a collection of brush, tree limbs, or several bags of yard waste, call 270-444-8511. Note: Yard waste generated/left by a private contractor will not be collected by City crews. Homeowners and/or the contractor must dispose of these materials. City of Paducah residents may also drop off their yard waste at our yard waste/biosolids recycling center and compost facility located at 1560 North 8th Street. There is no charge for City residents to drop off yard waste. Fees apply to residents who live outside the Paducah city limits and to commercial organizations such as lawn services. The fees are listed in the table below. This compost facility accepts green waste such as bagged or loose leaves, tree trimmings, and brush. This green waste is used as a bulking agent with biosolids from the wastewater treatment plant to produce an enriched soil amendment. Compost is available for purchase at the fees listed below. Monday through Saturday 7 a.m.-3 p.m.
To dispose of a live Christmas tree, the City of Paducah urges residents to recycle by taking the tree to the Compost Facility located at 1560 North 8th Street during regular business hours. The facility is open Monday through Saturday, 7 a.m.-3 p.m. Please remove all lights, garland, and ornaments before taking the tree to the Compost Facility. Residents also can dispose of trees by calling the Engineering-Public Works Department at 270-444-8511 to request the tree to be picked up by city crews. 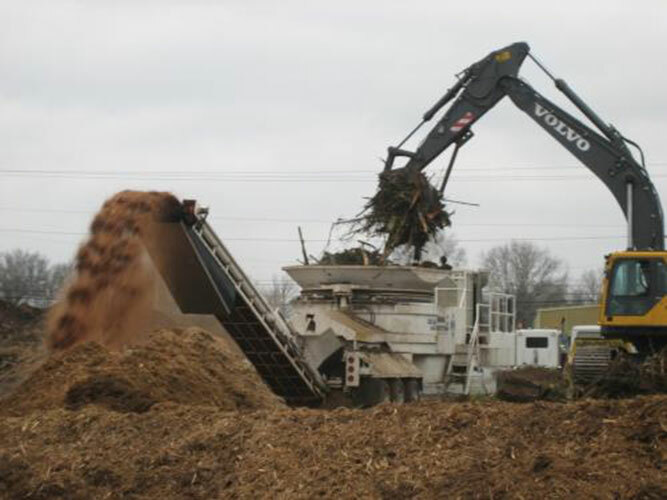 Composted biosolids are the combination of the solids produced during the wastewater treatment process and a bulking agent such as wood chips, ground yard waste, leaves, and/or saw dust. These are blended together and placed in windrows to produce the optimum environment for natural microbial breakdown and digestion. The benefit of using properly treated biosolids is that it increases the organic matter content of the soil. This can improve the overall performance of the soil. Compost contains nutrients that, when returned to the soil, are used by the plants. This is nature's way of recycling. The composted biosolids may be used as a surface dressing on yards or around plants or incorporated directly into the soil. Compost holds up to 6 times its own weight in water. Soil with a healthy amount of organic matter soaks up water like a sponge and regulates the water supply to the plants. On the other hand, a soil with a poor amount of organic matter resists water penetration, leading to crusting, erosion, and flooding. Although compost is considered a soil conditioner, rather than a fertilizer, it contains both plant nutrients and essential trace elements. Some chemical fertilizers release them before plants derive much benefit; so quickly that rain can leach the elements. In compost, most of the nitrogen and phosphorus are held in organic forms and slowly released making them available throughout the growing season. Compost can be used as a soil amendment in flower pots, flower beds, roses, blooming bulbs, vegetables, starting a lawn, maintaining a lawn, gardens, berries, ornamental shrubs, and around trees. The product has an approximate thirty-day processing period after which it is tested to meet federal and state requirements. Before composted biosolids can be distributed, the finished compost is tested for metal concentrations and pathogen removal which must meet stringent state and federal regulations. Quality control at the compost facility is directed by rigid state and federal regulations and the commitment by the City of Paducah to produce a quality produce. Through this composting operation the City of Paducah is reducing the waste stream by over 23%. This diversion occurs from the yard waste as well as the biosolids from the wastewater treatment process. The City of Paducah also offers a corrugated cardboard recycling program for local businesses. The cardboard is collected and recycled at the Republic Services Transfer Facility on Burnett Street. This amounts to approximately a 3% reduction in our waste stream. The combination of these recycling programs amounts to over a 26% reduction in our waste stream. This surpasses the state's goals for reduction and recycling set in 1997 of 25%. Visit Recycling to learn more about recycling in the City of Paducah.